Indian Muslim Association (IMA) conducted Isra Wal Me’raj program on Thursday dated 4th April after Esha prayer in Masjid Al-Adsani. Program started with the recitation of holy Quran and after recitation, Waleed Umari a famous orator delivered his speech on the subject of Core sprit of Isra Wal Me’raj. In beginning he communicated short story of Isra Wal Me’raj. He delivered learning lesson and teachings for us in Prophet PBUH observation during this holy journey in a very appealing way. He also illustrated gifts and commands being given to Prophet PBUH for this Umma during this miracle journey in very passionate way and recall us our responsibility and appeal to perform our duty. 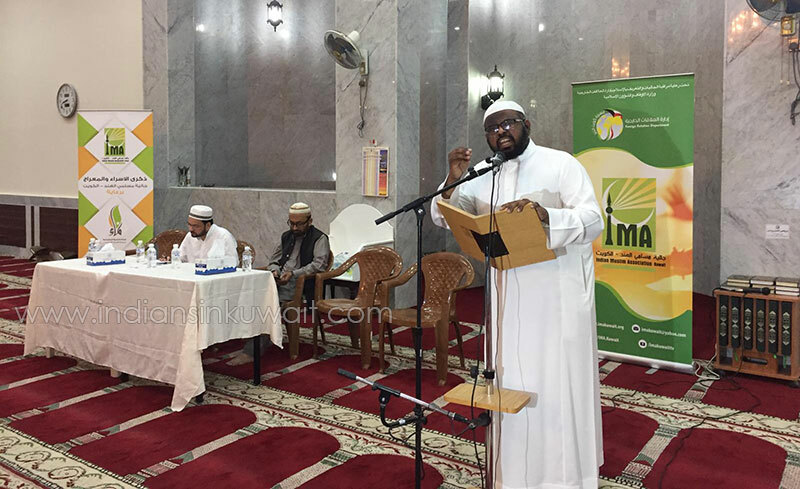 Ministry of Awqaf – Masjid Al-Kabir delegate Mohamed Ali also delivered his feelings on this occasion. Exclusively he mentioned that, quote of Masjid Hara’am in Meca and Masjid Aqsa in Qudus inside Quran shows strong relation between both cities and holy mosques. He mentioned strong relation of IMA with Masjid Al-Kaber and appreciated IMA efforts. Second public speech was delivered by visiting Indian eminent scholar Dr. Mohyudding Ghazi. in beginning he emphasized that this miracle journey happened in a very hard & harsh time of Prophet PBUH life and through this unbelievable journey, Almighty Allah gave his clear message to humanity that, Allah is so powerful and can do each & everything and he never leave his believers deprives and unsupported and must help in their hard time. He also mentioned that, by quoting both holy mosques through this miracle journey in Quran, Allah gave this message that, Masjid Hara’am which is under patronage of disbelieve of Quraish and Masjid Qudus which is controlled by Jews, very soon will be under Muslims and later History proved it. Dr. Ghazi also emphasized that we should connect our relation with great holy book of Quran. Salat is Me’raj of Muslims and we should perform it with the same imagination as we are in the heaven. We read Quran with the same sprit as we are meeting with angels & prophets, we are watching heaven & hells and we observe punishment of Almighty Allah, These all are the observation which Prophet PBUH did during his Isra Wal Me’raj journey and we too watch the same during the study of Quran. Concluding speech was delivered by IMA President Masood Shahab. First he extended his thanks to the participant who attended the program on IMA invitation and explained that, such programs being organized by IMA occasionally to provide a momentum to change our life and make our life practical with the teaching of Islam. He also urged that we should recognize our position that, we are a Dae Umma and we should perform our duty and in case of negligence we will be responsible in front of Allah. He concluded with this appeal that, we are close to holy month of Ramadan and every Muslim pay much attention towards Quran during Ramadan, we must utilize this Ramadan to understand Quran. The program end with the recitation of Dua. Around 600 people attended this program. Dinner packets were served at the end of program for all participants.